Students at Cheadle Hulme High School have achieved the best GCSE results for maths and English for state schools in the whole borough. Six students notched up six or more grade 9s with head girl Emily Lord achieving a clean sweep of top grades – nine Grade 9s! A third of all CHHS grades were a 7 or above – the equivalent of an A. A huge 67% of students scored between 9-5 for English and maths with 83% getting grades 9-4. This year, under the new GCSE grading system, as few as 200 pupils were expected to score all top grades, according to a recent study published by Cambridge Assessment, one of the country’s biggest exam boards. Head girl Emily, from Cheadle, swept the board achieving Grade 9 in each of her nine subjects, placing her in the top 0.03% of the country. She is looking forward to studying A-levels at Cheadle Hulme High School’s Sixth Form. Headteacher Linda Magrath said: “Yet again our students have lived up to our high expectations and achieved wonderful GCSE results. Their hard work, alongside the dedication of all the staff here, has paid off and we are so proud of them all. Over the last 12 months Cheadle Hulme High School has won the MEN Schools Awards Secondary School of the Year. It was named in the top 3% of schools nationally for the progress that students make. 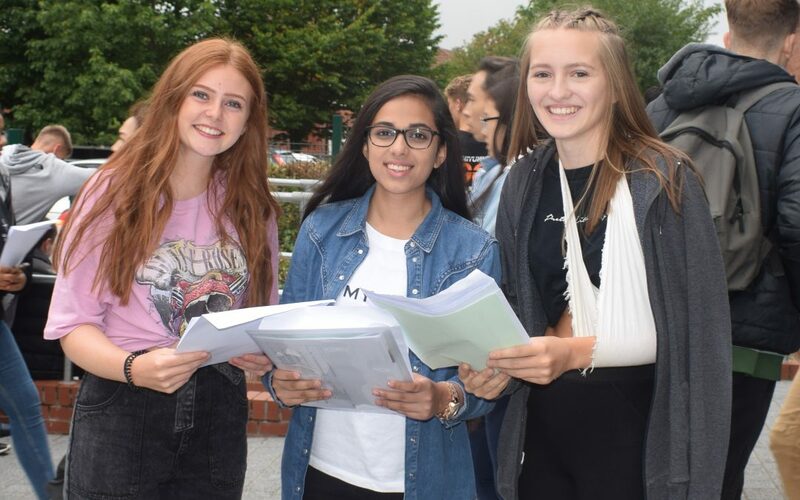 The Good Schools Guide has recognised CHHS as the top fully comprehensive non-denominational state secondary school in the North West and last week’s A-level results saw nearly a third of students achieve three or more A*/A grades, with 70% of students winning places at their first choice university.